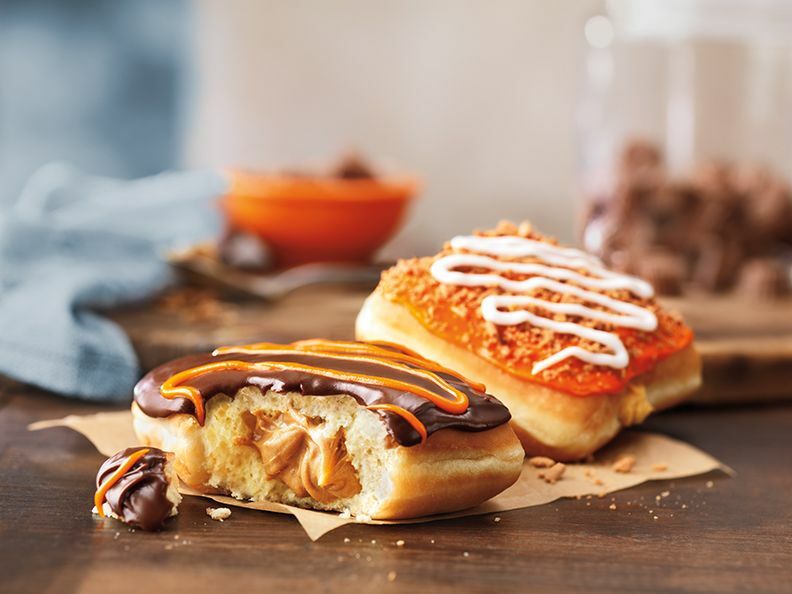 CANTON, MA (August 27, 2015) – This autumn, Dunkin’ Donuts is sweetening the season with the addition of two exciting new donuts to its fall lineup. For the first time, Dunkin’ Donuts has partnered with The Hershey Company to put the tastes of creamy chocolate and REESE’S Peanut Butter together in one tasty treat with the new REESE’S Peanut Butter Square. For pumpkin fans looking to celebrate a favorite flavor of fall in a fun new way, Dunkin’ Donuts has also expanded its famous pumpkin menu with the introduction of the Pumpkin Cheesecake Square. Both items will be available for a limited time at participating Dunkin' Donuts restaurants beginning August 31. A creative twist on the classic candy, Dunkin’ Donuts’ new REESE’S Peanut Butter Square is filled with rich and creamy REESE’S peanut butter buttercreme, topped with chocolate icing and finished with an orange icing drizzle to match the colors of the traditional REESE’S Peanut Butter Cups. The Pumpkin Cheesecake Square is filled with smooth and creamy pumpkin cheesecake filling and topped with orange icing, crumbled graham cracker topping and finished with a white icing drizzle. Dunkin’ Donuts is featuring a full lineup of fall-flavored treats this season. Back by popular demand at Dunkin’ Donuts restaurants nationwide by August 31, the pumpkin menu includes Dunkin’ Donuts’ famous hot or iced pumpkin coffee and lattes, Pumpkin Donut and MUNCHKINS® Donut Hole Treats, Pumpkin Muffin, and Pumpkin K-Cup® pods and Packaged Coffee. Along with enjoying the brand’s autumn lineup of food and beverages, Dunkin’ Donuts fans can put their passion for pumpkin on display via the brand’s special Snapchat filters. A fun way for people to show their spirit for fall with friends and followers, Dunkin’ Donuts’ first geo-filters will be available beginning today for fans in or around a Dunkin’ Donuts restaurant, with new ones introduced later in September. Additionally, fans can follow Dunkin’ Donuts’ official Facebook, Twitter and Instagram feeds throughout the coming months for pumpkin and fall-related content from both the brand and special guests. Founded in 1950, Dunkin' Donuts is America's favorite all-day, everyday stop for coffee and baked goods. Dunkin' Donuts is a market leader in the hot regular/decaf/flavored coffee, iced coffee, donut, bagel and muffin categories. Dunkin' Donuts has earned the No. 1 ranking for customer loyalty in the coffee category by Brand Keys for nine years running. The company has more than 11,400 restaurants in 39 countries worldwide. Based in Canton, Mass., Dunkin' Donuts is part of the Dunkin' Brands Group, Inc. (Nasdaq: DNKN) family of companies. For more information, visit www.DunkinDonuts.com.